(U.S. Senate) - U.S. 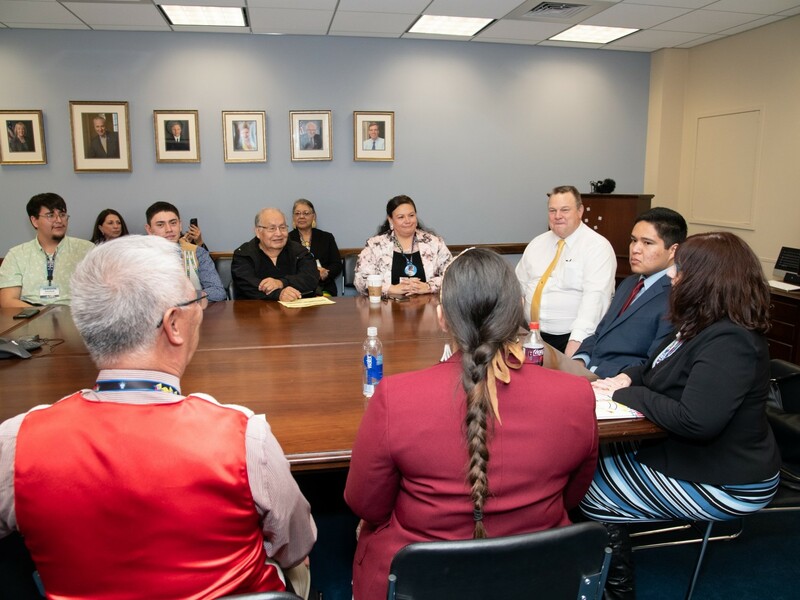 Senator Jon Tester recently met with students and representatives from each of Montana's seven tribal colleges after his resolution to designate February 3-9 as ‘National Tribal Colleges and Universities Week' passed the Senate. "Our higher education institutions are part of the fabric of Indian Country," said Tester, a long-time member and former Chairman of the Senate Committee on Indian Affairs. "Montana's tribal colleges and universities are training the next generation of Native American leaders and are vital to economic success in Indian Country, so we've got to ensure they have the tools to give students the opportunities to succeed." Montana is home to more tribal colleges than any other state. Tester has long been a champion of promoting education in Indian Country, helping to get students access to knowledge and skills grounded in cultural traditions and values. On Tuesday, Tester introduced the Studying the Missing and Murdered Indian Crisis Act to address the crisis of Missing and Murdered Indigenous Women (MMIW). His bill requires the Government Accountability Office (GAO) to review federal agency responses to reports of missing and murdered Native Americans, which often fall short. The bill also directs the GAO to make recommendations to agencies and Congress about how to address these failings and provide solutions to other problems that are contributing to the crisis. Also this week, two of Tester's bipartisan bills to better support Native American veterans and strengthen native language programs cleared a key legislative hurdle. The Senate Committee on Indian Affairs debated and passed Tester's Tribal HUD-VASH Act to formally codify a successful tribal housing initiative that provides rental and housing assistance to homeless and at-risk veterans in Indian Country, as well as the Esther Martinez Native American Languages Programs Reauthorization Act to revitalize and expand Native American languages. These bills will now be considered by the full Senate. Tester also recently reintroduced the SURVIVE Act, which unanimously passed the Senate Committee on Indian Affairs, as well as Savanna's Act to combat the crisis of Missing and Murdered Indigenous Women.